Chill out with a cocktail without exiting the action at Breeze Bar. 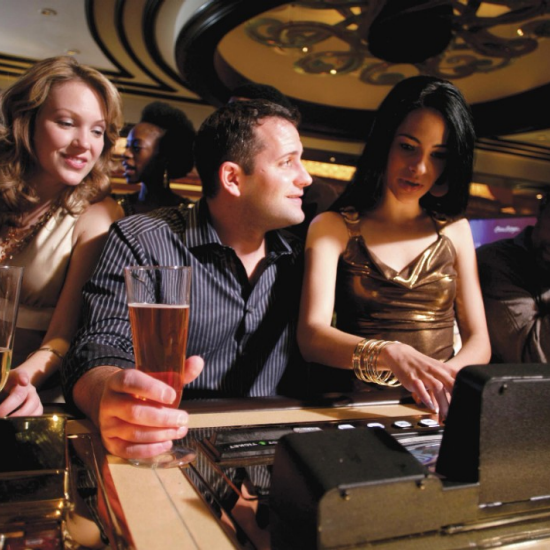 Located in the heart of the casino, Breeze Bar offers comfortable table seating as well as an expansive bar lined with video poker. A great place for a conversation or just sitting back and enjoying the casino view, Breeze Bar is never more than a few steps from your favorite games. From the Hotel Lobby, walk past The Jewelry Box toward the casino. Follow the wide middle aisle in table games to about the midway point and take a left to the Breeze Bar. Exit from the parking garage elevators and take a right through the glass doors onto The Shopping Promenade. Continue to the Hotel Lobby and take a right past The Jewelry Box, and continue into the casino on the wide middle aisle in table games. The Breeze Bar will be on the left. The ultra-cool vibe of EIGHT75 is ideal for pre- or post-dinner drinks, meeting up after a show or just spending time with friends. With luxurious booths can be sociable or romantic, depending on your mood and the company.Cutting edge design takes center stage throughout the space.